The 25th instalment in a series of lessons learned over the years. What do I know now that I didn’t then? What wisdom would I impart to my younger self, given the opportunity? Architects have long held the unflattering reputation as being poor businesspeople. This is probably rooted in truth, and all the more unfortunate because of it. The equation is simple: we may start our architecture practices because we love designing, but the only way we can keep doing so is if we are good at business. There are three areas of business activity for which we have developed (and continue to develop) appreciation and skills. We must manage our time. We need to budget how long it will take us to complete a project so we don’t end up diluting our fees so much we could have earned more flipping burgers. Typically, we earn $40 – 50 an hour on a project, gross. This is probably half what it should be, and a source of constant reflection. Budgeting our time also helps us meet our deadlines and keep our clients happy. We must manage our finances. We need to keep a track of income, salaries, overheads and cashflow. Knowing how much we earn and spend helps us structure future fee proposals to better cover our costs and profit. Knowing when we earn and spend helps us avoid a dangerous boom and bust financial cycle. Finally, we must manage our public profile. The most lasting and meaningful marketing lesson we have ever learnt is this: do good work, then put it where people can see it. What’s so important about this lesson is its two halves. Doing good work is critical, but it’s not enough. We need to be good designers and we need to be good sellers. An extension of this insight, and the second most meaningful marketing lesson we have ever learnt is this: more is more. Marketing is a both / and scenario, an additive numbers game. We spread our work as far and as wide as we possibly can in the hope that of every 100 people who see it, one will give us a call. Business is not a dirty word. 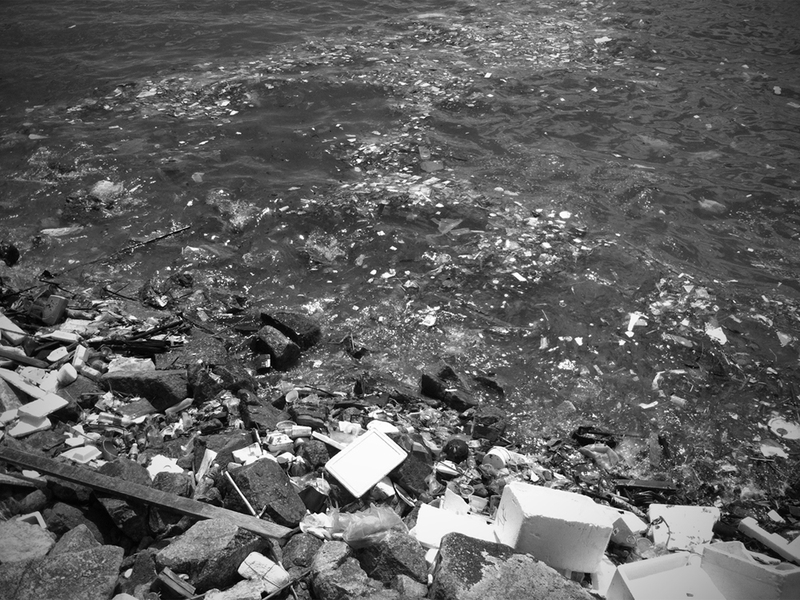 The Great Hong Kong Garbage Patch. Journey to the Plastic Ocean, copyright Tracey Read.